The Nest Hello provides serious competition for the Ring 2 in the smart doorbell sector, with a stylish design, HD HDR video, face recognition and an easy to use application. Installation may be more of a hassle, but if you’re in the market for a clever door guard the Hello certainly needs to be considered. Your final choice will likely come down to the installation process, and the aesthetics of the two smart doorbells, but the Nest Hello offers an excellent experience. The Nest Hello price is $229 (£229) for the device, but Nest offers a professional installation package in the UK which takes the cost up to £329 (around $430). 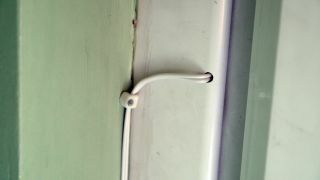 That’s £100 for installation, so you may want to get a few quotes from local fitters to see if they can do it cheaper. It does mean it’s a touch more expensive than the Ring 2, but if you shop around the Hello can be found a little cheaper away from Nest’s official site. Another way to save some money is to purchase some other Nest products at the same time, but bundle deals differ by region so you’ll need to check on your local Nest website. The Nest Hello is a great-looking device, with a slender design making it a slicker, more premium offering than the slightly bulkier Ring. The slimmer design means the Hello is easier to fit into tighter spaces, such as the slender frame round our door – a place the Ring would simply be too large to go. You only get the one color, black, with a blue halo light around the button. It may not suit everyone’s taste, but it looks smart when mounted. However, the Hello is slightly more problematic out of the box, as it needs to be hardwired to your home’s electrics. This means most purchasers will need an electrician to install the Nest Hello, and you’ll also need to purchase a chime separately if your house doesn’t already have one, adding to the cost. Installation time will vary depending on your home’s configuration, but it took our electrician around an hour to fit the Hello, as they needed to run a wire from the nearest socket to the door (you’ll need a free socket available to plug the Hello in). This involved our installer drilling through a wall and tacking a length of slender wire subtly along the skirting and around a door frame. It’s here that the Ring 2 has the upper hand, as it’s battery powered, and so can be easily installed by anyone with basic DIY skills (although you can also have it hardwired, for which you’ll need a professional). However, once the Hello is installed you’ll never need to worry about changing or charging the batteries, as it’s always connected to the mains. 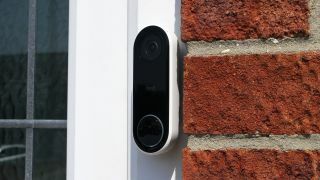 As well as the doorbell itself, the box contains the wall mount and an optional 30-degree wedge, allowing you to angle the camera slightly for a better view. The brickwork around our door protrudes beyond the door frame slightly, so we opted for the wedge to provide an uninterrupted, 160-degree view of our driveway. You also get a blue Nest shield sticker to place in a window, to alert those approaching the house that you have a camera – handy as an additional deterrent to would-be criminals. When the Nest is all wired up you’ll need to get your smartphone, download the Nest app (available on Android and iOS) and set up an account (if you don’t already have one). If you already own other Nest products you can simply add the Hello to the app on your phone. Setup is painless, with clear step-by-step instructions helping you link your new Nest doorbell to your phone and home Wi-Fi network. It took a few minutes to get through all the steps, but when done we were up and running immediately. 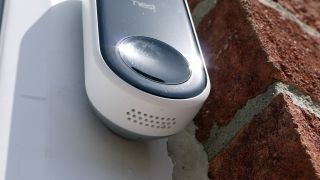 We were impressed with the Nest Hello very quickly, as just the next day we were sitting in the TechRadar office when a delivery driver approached our home and rang the bell. We received an immediate notification on our phone that someone had rung, and by tapping it we were launched into the Nest app to view the live video stream. The stream includes audio, so you can hear as well as see what’s going on, and you can use the built-in microphone to talk to people at your door. There’s very little latency on the audio, and the Hello provides clear, crisp sound, making it easy for the person at the door to hear you. We do live in a quiet street though, so we can’t vouch for the audio performance in noiser settings, but the volume is nice and loud. We were able to instruct the driver to leave the package in a safe space, and after the initial look of surprise on their face as the doorbell spoke to them, they were able to understand our instructions; they even gave us a nice thumbs-up once they’d deposited the package. 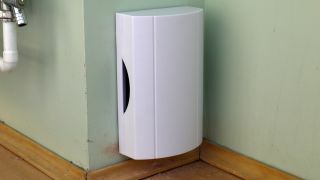 While this worked well over the stable Wi-Fi connection in the TechRadar office, when we attempted to talk to another delivery person during a car ride with patchy signal it didn’t really work. That’s no surprise, as your smartphone will need a solid connection to hold the livestream, so if you’re expecting an important delivery while you’re away from home ensure you have good signal. The Hello does allow you to set pre-recorded messages, which you can play when you don’t feel like speaking live, or when your phone connection is patchy. Its worth noting that your home Wi-Fi connection needs to be relatively robust for smooth video recording and livestreaming. You can adjust the quality of the video in the app, so if your internet connection at home isn’t overly fast you can reduce it so you still get smooth, real-time footage, although it will be of reduced quality. Initially we had to use the lowest video quality setting, but shortly after installation we upgraded our broadband to fiber optic (with a guaranteed minimum speed of 30Mbps), which allowed us to opt for the highest video quality. 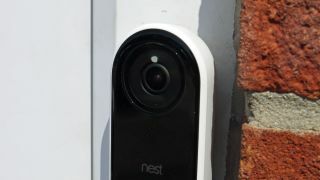 The Nest Hello also has a robust night mode camera, which continues to provide clear footage of people, vehicles and other moving objects after dark. Another useful feature on the Nest Hello is the Familiar Face function, which uses facial recognition to let you know who’s at the door. The Nest Hello captures the face of everyone who approaches your door, and in the app you can easily assing names to those you know. It means you get a notification whenever a loved one, family member or friend arrives or leaves – a great bit of piece of mind for parents. The face recognition improves over time, and the more a person visits the bigger the library of shots, enabling the Hello to be even more efficient in who it can identify. One thing to note, though, is that the quality of your home Wi-Fi will determine how good the video stream and recording are. Our home Wi-Fi wasn’t the best when the Hello was installed (average speed of well under 10Mbps) which meant the highest recording quality just wasn’t possible for us. It was a buffering, jumping mess. You get three levels of quality to pick from, and at the lowest resolution video was smooth, but it was trickier to pick out people’s faces; we settled on the middle resolution, which still worked well on our connection. However, when we upgraded our broadband we were able to up the resolution to the max, giving us beautiful crisp and clear visuals. A word of warning though: the Nest Hello uploads an awful lot of data to the cloud, so if you’re on a restrictive broadband plan you’ll want want to keep the resolution low. The Nest Hello will save video clips of detected motion and people from the past five days, but footage older than that will be deleted unless you take out the Nest Aware subscription package. Nest Aware provides 24/7 video recording stored for up to 30 days, and provides access to the Familiar Face functionality. Rather than just storing clips, an Aware subscription will give you access to the full 24 hours recording from each day, allowing you to scan through footage from entire days. In the US you’re looking at $5 per month, or $50 a year (a saving of $10 annually). 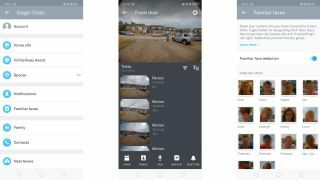 In the UK the Nest Aware subscription will cost you £24 per month, or £240 annually, for the full 30-day video history. However, there are cheaper options, with five-day (£4pm or £40pa) and 10-day (£8pm or £80pa) video history subscriptions also available. The good news is that you get a 30-day free trial of Nest Aware, allowing you to gauge whether or not the subscription is worth it for you. We’d recommend starting with the five-day subscription if you want the additional features and seeing how you get on – you can always upgrade if you decide you want access to a longer video history. 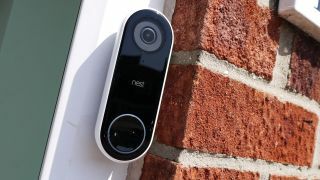 The Nest Hello isn’t the cheapest smart doorbell on the market, but if you’re looking for a good-looking, easy to use, featured-packed device that also doubles as an excellent security camera it offers decent value for money. For most, the five-day video history subscription to Nest Aware will likely suffice, which isn’t that much to shell out each month, but for the more security conscious (and deeper pocketed) the option to access footage from a longer time period will also be appealing.